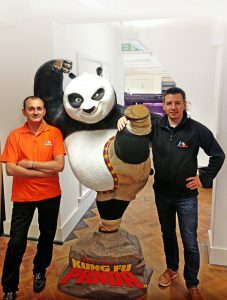 We have had a pleasure of dealing with an unusual request and rather some unusual characters 🙂 All courtesy of our client DreamWorks, film production company (initially founded by Stephen Spielberg), Â which released such blockbuster movies as: ‘Kung Fu Panda’, ‘Madagascar’ or ‘Shrek’. We have been assisting them with the move to their new premises. Â As you can see, some of us got quite excited about it! 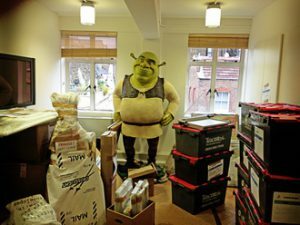 Especially with the opportunity to meet some of our childhood heroes “in person” and make sure they arrive at their new “home” all safe and sound. The move involved crate hire and management and moving of all effects, arranging in the new office and setting everything for the opening of DreamWork’s new headquarters near Leicester Square on Tuesday 26th of August.